Operation: ROOIGROND | "Together, we can overcome…"
A video by Matakutso and Gontse, to whom the community are grateful. Through the use of social networks, we have come across a number of wonderful, inspirational people who have made an impact in what we do in various ways. One of our earliest online friends was Murray Ingram. With his wise words, he inspired our work in many ways and helped us persevere despite the tough times we occasionally face. What fascinated us most about him though is that in a world full of talkers, he is quite a doer and believes that doing is one’s way of talking. We kept on communicating with him, still do and his message is has always been the same; compassion, service, humility and humanity and like Ghandi, he believes that ‘one’s life should be one’s message’. In 2011, we were pleasantly surprised when he offered to come all the way from Cape Town to see what our humble community initiative was about. Despite the surprise, we gladly accepted, looking forward to his visit. It would be the first time that we meet any of our ‘online friends’ and being believers that “together, we can overcome”, we are always keen to extend our community beyond the confinements of Rooigrond. He came, bringing with him quite an impressive storm- which eventually followed him back and we were honoured to show him around, with our centre being the first stop. He met with members of the community; was shown around and even had the time to teach us a few lessons on meditation and its’ value. Without a doubt, a lack of access to information remains a serious problem in rural and marginalised communities. This is because it affects people’s ability to claim their rights and it is a barrier to access to opportunity, amongst many more negative attributes that go along with it. As part of our efforts to raise awareness about this community initiative we have going in Rooigrond, we started dabbling in ICTs, which we found to be a powerful tool in many ways. This started us thinking about mobile phones and the possibilities they hold- particularly with the issue of access to information-, as even the most basic of phones lately are WAP enabled. However, not being very ‘tech-savvy’ ourselves, we had all these ideas and questions, but were unable to discuss them and get any direction on which path to take. This changed however upon our meeting David Bernard, CEO of SANGONeT- an organisation aimed at empowering non-profits through the ICTs, at the North-West University. After listening to Mr. Bernard’s presentation on the potential role social media can play in non-profits, amongst many other uses of technology in communities such as ours. We finally were given a chance to share our thoughts on the matter, especially our concerns about the lack of information in the North-West province, which have prevented organisations and communities from exploiting the potential of ICTs. Having shared our views and finally having our many questions answered enabled us to really get going on our plans of enabling the community to access information; which has the potential to assist not only in allowing residents to claim their rights, but also to develop themselves and the community as a whole. As much as we are passionate about what we do, we know that we cannot create positive change on our own, hence our motto, “together, we can overcome”- a motto that reflects our belief that positive change and social transformation can only happen if we all join hands and work together to make it happen. However, without a doubt there is a serious lack of cooperation amongst communities and organisations in the North-West province. This is caused by a number of factors, with the most notable being that organisations and community initiatives in the province are unaware of each others’ existence. A lack of adequate communication resources and initiatives bringing forces of positive change together has been severely lacking and in many ways it affects the ability of organisations and initiatives to fulfil their mandates as when approached with a matter beyond their scope, they are unable to refer a beneficiary elsewhere, where the person or peope can be assisted. As such, we were very excited when Connie Legodi-Bogatsu, the community services coordinator of the Mafikeng campus of the North West University, invited us over for a workshop aimed at empowering non-profits and community initiatives. The workshop, organised by Beatrix Bouman- the North West University’s Director of Community Engagement, saw organisations and initiatives from all over the North-West come together and we saw this not only as an opportunity to be empowered to better service our community- but also to network with others fighting for positive change. 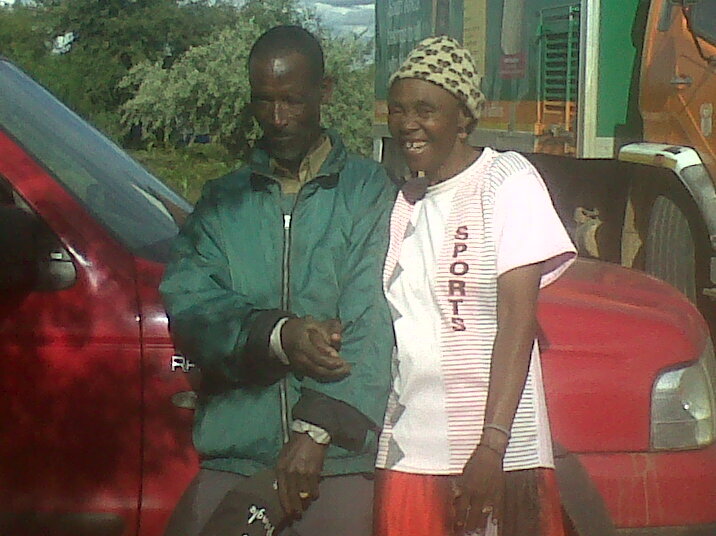 It has been said that “love is temporary madness”, but for Rre Segwedi and MmaNaledi of Rooigrond, love has seen them through the worst and the best years of their lives. 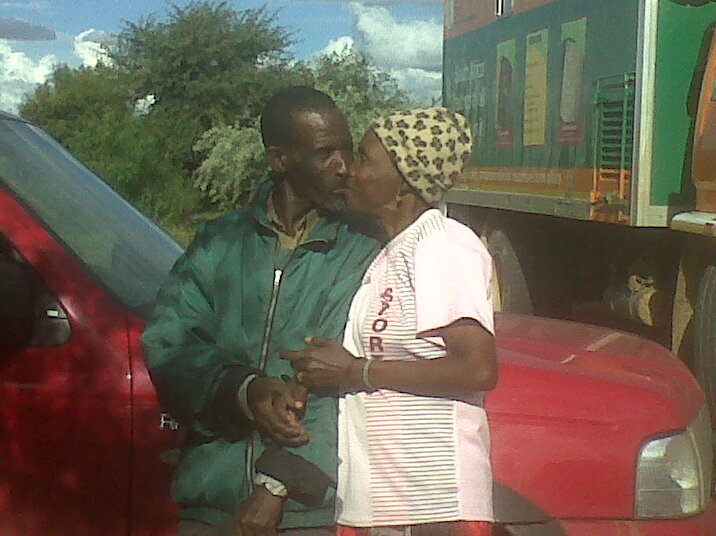 This elderly couple, also residents in the Rooigrond Informal Settlement have had a dream of being married officially for many years and with time passing by, their dream of doing so never dimished. 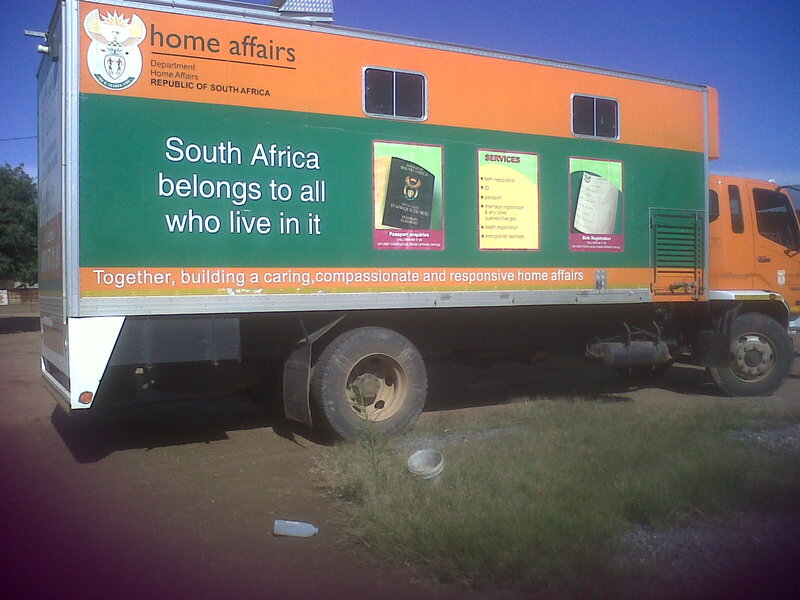 However, like many other members of rural,marginalised communities- their chances of doing this were rather slim due to an inability to access the Department of Home Affairs and by virtue of not being registered citizens. Unlike many other such love stories, theirs had quite a happy ending. Upon us having the Department of Home Affairs over to register our people, not only did the couple apply for their IDs, but they were also legally wed- a dream come true for this couple. Two children and four grandchildren later, they finally officially became Mr. and Mrs. Segwedi to the great delight of the rest of the community. “May 15 is celebrated as the International Day of the Family. This day highlights the importance of families. It aims at fostering equality, bringing about a fuller sharing of domestic responsibilities and employment opportunities. The programmes undertaken to commemorate the day, work towards supporting families in the discharge of their functions. They tend to promote the inherent strengths of families, including their great capacity of self-reliance, and stimulate self-sustaining activities. However, within the context of many marginalised communities such as Rooigrond, ‘family’ goes beyond its’ usual mother, father and children definition. Due to the large number of single-parent families; child-headed families; migration to seek access to opportunity; family refers more to the community as a whole; as the community looks out for each others well-being. So, in celebrating the International Day of the Family, we decided to celebrate it with the community as a whole and with activities that empower each member of it. The day was celebrated on Saturday, the 21st May 2011, to ensure that the majority of the community could participate in what turned out to be a great day of fun and empowerment for all in Rooigrond. The Department of Home Affairs, SASSA and SAPS once more assisted us greatly in ensuring that members of our community could apply for IDs, birth certificates and social grants, all things which are greatly difficult to access for those in marginalised communities. The Department of Health, on the other hand, provided HCT services, giving those in the community- which has neither a clinic nor hospital, an opportunity to know their status. Apart from this, health talks were conducted between different little groups amongst the crowd. These health talks were done in Setswana to ensure that community members could understand and focused on matters which are problem areas within the Rooigrond context. FAMSA and the Department of Social Development, along with the Department of Correctional Services were also a part of the day’s activities each discussing the services they offer, as well as having presentations on matters which tear families or in our instance, communities apart. Topics included domestic violence, substance abuse and the consequences of crime, amongst many more. To ensure the day appealed to all, both young and old alike, great performances came from our very own cultural dancers too- with the Department of Sports, Arts and Culture offering fun, games and exercise to all present. At the Rooigrond Early Learning Centre, we believe that a healthy body has its’ part to play in the achievement of a healthy mind. As such, nutrition is something we took into great account when creating the menu for our Early Learning Centre and it all starts with a nutritious breakfast each day. We seek to not only develop and nurture young minds at the Centre, but also play a part in healthy living, through encouraging healthy eating patterns amongst these kiddies. A scathing slap across the face, followed by another. As she falls, she tries to protect the child on her back. The man kicks her, over and over again. He walks away and she’s relieved that her routine beating is over- little did she know that this time, it would be different. As she stands up, preparing to take the screaming baby off her back, she hears him approaching her- which is odd, as he always leaves after beating her. She looks up and without realising what is happening, her baby let’s out a piercing scream; which would be his last. Her partner had returned with a hosepipe to finish what he had started and had accidentally hit the child on his partner’s back- a child who was his flesh and blood, a child who died at his hands. This is just one of the many realities in the Rooigrond Informal Settlement, where Domestic Violence is rife. Many scenes like these play themselves out on a daily basis and unfortunately, the end result is always tragedy. Despite this endless occurrence of tragedy, the silence about this reality from victims; authorities and every other stakeholder in the matter is quite alarming. As such, we took it upon ourselves to hold all those involved accountable and ensure that our team is adequately empowered to support victims and their families and also to share what could be life saving information with the community. On the 5th April 2011, when POWA hosted a Domestic Violence Imbizo in Lonely Park, Mafikeng, with all stakeholders participating, we ensured that members of our team participated; sharing the problems experienced in Rooigrond; alerting SAPS to the lack of response at their end; pointing out the lack of social support for victims and starting a move for co-operation with all present, to ensure the eradication of this evil lurking in our society. It was a great day and all information gathered is continuously ploughed back into the community. Considering that, “many women are still unaware of their rights when reporting abuse and even informed women traumatised by an assault are unlikely to be assertive and insist on their rights. Many women are afraid of further violence from the perpetrator if they attempt legal action. This is even more compounded by the introduction of the new Domestic Violence Act which a lot of women have not yet grasped…”, we hope that through our continuous efforts to support and share information with the community, in time this too shall be overcome. Operation: ROOIGROND does more than facilitate positive change in the Rooigrond Informal Settlement, we are also advocates of social justice for this often forgotten community. We seek not only to break the cycle of poverty in the community, but also to break the cycle of social exclusion- which plays a huge part in the many injustices suffered by the community members. As such, we were quick to accept a request from the Commission for Gender Equality to form a partnership for the hosting of a public hearing on women, poverty and energy, in the Rooigrond Informal Settlement area. After the successful hosting of our ‘Human Rights Day’ event, the Commission found us to be in an ideal position to successfully co-ordinate a public hearing on their behalf. Our acceptance of this request, was based entirely on the knowledge that, the community itself is fully aware of the challenges it faces, with regards to women, poverty and energy and as such, they themselves also have ideas on how these challenges can be overcome. Unfortunately, due to the social exclusion suffered by the community, never have they ever had a chance to share their views and actively participate in the overcoming of these challenges. On the 29th March 2011, over 100 community members were mobilised, to participate in what would be a historic occasion in the settlement. The community members were joined by, members of the Commission for Gender Equality; the North-West University and the Department of Health, amongst others. Vibrant and necessary discourse about the various challenges faced by women due to poverty and a lack of energy followed. The community identified their problems and also proposed solutions to these problems, citing the various means that could be used to assist them solve these problems. The Public Hearing, which was ended with a late lunch courtesy of the Commission for Gender Equality, was a huge success- not only because an environment encouraging participation was created, but also the psychological benefits of having a socially excluded community having their voices heard. Without a doubt, there is no single cause that can be named for child neglect/abuse. We also cannot deny that child neglect/abuse occurs across socio-economic, religious, cultural, racial, and ethnic groups. Despite this, there is no doubt that certain factors within families, communities and nations put children at a higher risk of being neglected and/or abused. However, it should be noted that this does not mean that the presence of these factors will always result in child abuse and neglect. The factors that may contribute to neglect or abuse in one family may not result in child abuse and neglect in another family. – Poverty and unemployment, which when interacting with other risk factors such as depression, substance abuse, and social isolation—can increase the likelihood of both child neglect and child abuse. With all these factors being rife in the Rooigrond Informal Settlement area and with cases of neglect and abuse being on the rise, we realised that intervention was necessary. On the 22nd March 2011, the day after Human Rights Day, we hosted a ‘Child Protection’ themed Human Rights Day information sharing centre in the Rooigrond Informal Settlement area. Stakeholders involved in the protection of children, were invited to provide the community with information about child abuse and neglect, as well as their various roles in eradicating it; assisting with it and where they are based. The information sharing session also allowed the community to learn how to access services provided by the state at no cost, with the aim of protecting children. Stakeholders who assist in the eradication of some risk factors for children were also invited to participate in the event. The session which was attended by, The Office of the Family Advocate; the Child Protection Unit; the Commission for Gender Equality, as well as the Independent Complaints Directorate. It was the first time ever in the Rooigrond Informal Settlement, that so many stakeholders got together in a united, concerted effort to secure the protection of children. The community came out in numbers, eager to be a part of the process of empowerment. Through empowerment and access to information, we ensured to bring the rights, safety and protection of our children to the fore. With children being our greatest resource, we will continue to build partnerships that ensure they are protected.